Offering you a complete choice of products which include ro 500 lph water treatment plant, water treatment system and industrial water treatment plant. 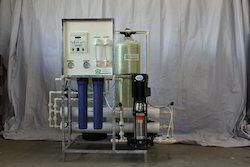 With the assistance of our skilled team members, we bring forth RO 600 Lph Water Treatment Plant that makes use of reverse osmosis principle for water treatment. Proffered series cleans the contaminants in water and removes non-essential and corrosive salts, metals and chemicals. The commercial RO Plants are apt for drinking water purification, food-processing industry, effluent and wastewater purification, dialysis, car washing and other uses. We are highly instrumental in dispatching a superior range of Water Treatment System (RO 100 LPH To 500 LPH Water Treatment System). This range is ideally utilized in packaging of drinking and mineral water. The offered water treatment systems are available in different capacities such as 100 to 500 LPH, so as to maintain their conformation with the diverse requirements of clients. Backed by the rich experience and vast manufacturing facility, we are able to offer a superior range of RO Water Purifier with SS Coolers. These RO water purifier with SS coolers offered by us are widely applicable in different areas such as homes, offices, industrial, commercial and educational institutions. In addition to this, the offered range is best suited for installation under kitchen counter with the focus mounted on sink. This range is also ideal for the water coolers.